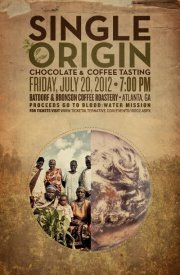 On Friday, July 20th at 7pm, join Batdorf & Bronson Coffee for an evening of tasting single origin chocolates from Cacao Atlanta, and coffees from Batdorf & Bronson Coffee. You'll enjoy the differences in coffee and chocolate from around the globe, including new coffee and cacao crops just in. All proceeds benefit Blood: Water Mission, an organization that works to build clean water wells and catchment systems and provide much needed HIV medication all over Africa, especially around coffee growing regions. The Ride: Well Team, a cycling team traveling cross-country raising money and awareness for Blood: Water Mission will be on hand to talk about both Blood:Water and their journey. There will be cool door prizes from local businesses. $20 Suggested Donation, all going to Blood: Water Mission.